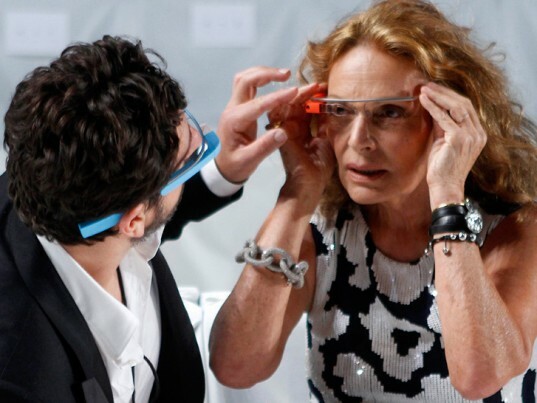 Diane von Furstenberg shared her New York Fashion Week spotlight on Sunday with an unlikely collaborator: Google. The legendary designer and Council of Fashion Designers of America president sent Google’s much-vaunted augmented-reality goggles down the Lincoln Center catwalk with her Spring/Summer 2013 collection. Von Furstenberg even had Google founder Sergey Brin join her and her creative director, Yvan Mispelaere, on the runway for her victory lap. Each sported a pair of the futuristic frames with a different colored accent: von Fursteberg in orange, Brin in blue, and Mispelaere in black. If fashion and technology’s newfound coupledom wasn’t clear enough before, consider their union official. Diane von Furstenberg shared her New York Fashion Week spotlight on Sunday with an unlikely collaborator: Google. The legendary designer and Council of Fashion Designers of America president sent Google's much-vaunted augmented-reality goggles down the Lincoln Center catwalk with her Spring/Summer 2013 collection. Von Furstenberg even had Google founder Sergey Brin join her and her creative director, Yvan Mispelaere, on the runway for her victory lap. Each sported a pair of the futuristic frames with a different colored accent: von Fursteberg in orange, Brin in blue, and Mispelaere in black.